This is the Alan Turing centenary year, and Alan Turing would have been 100 years old this month (on 23rd June) if he had lived this long. As well as inventing computers, theories of decidability, computability, computational cryptography and artificial intelligence, just before his death he also studied the relationship between mathematics and the shapes and structures found in biology. How do patterns in plants, such as the spiral packing of the seeds found in the head of a sunflower, come about? This year, in a big experiment, devised by Prof Jonathan Swinton to celebrate his centenary, sunflowers are being grown across the country. The seed heads will be collected, their patterns counted, then hopefully the results will demonstrate the relationship between Fibonacci numbers and biological growth that Turing was investigating. 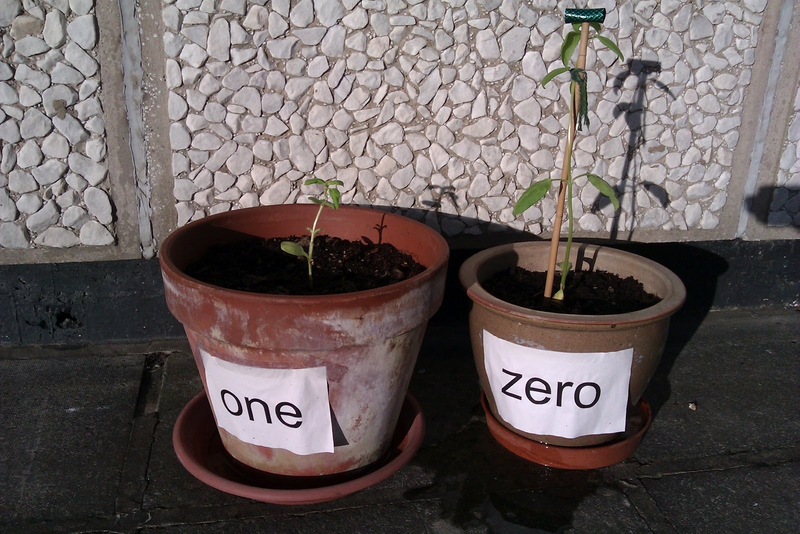 We're growing two sunflowers here in the Dept of Computer Science at Aberystwyth University as part of this experiment. Their names were voted on by the Department, and "one" and "zero" were chosen. "Most of an organism, most of the time, is developing from one pattern into another, rather than from homogeneity into a pattern. One would like to be able to follow this more general process mathematically also. The difficulties are, however, such that one cannot hope to have any embracing theory of such processes, beyond the statement of the equations. It might be possible, however, to treat a few particular cases in detail with the aid of a digital computer." He then goes on to elaborate further on how computers have already been extremely useful to him in helping him to understand his models (no need to make so many simplifying assumptions). The fact that he actually used computers to investigate the models underlying biology, makes him the first bioinformatician / computational biologist. The fact that he could see the future, and could see how computers would enable us to model and explore the natural sciences makes him an amazingly visionary scientist. See the list of books that Turing read as a teenager at school. This list was extracted from his school library record. Manchester Uni are hosting a Turing Centenary Conference this month, with a host of famous names in computer science giving talks in his honour.